The Park at Spring Canyon at the shores of Lake Roosevelt. Hundreds of feet of Sandy Beach and 10's of acres of Grassy Park, complete with BBQ pits, Picnic tables and Shade Trees, Creates for old-fashion family Summer time Fun! There is a Designated Swimming Area, which hosts a 20 foot square dock in the center surrounded by a huge log boom. sand Volly Ball court for the Adults. The Park Rangers put on Nightly or Weekly Shows and Presentations at the Amphitheater at the West end of the Park During the Summer. You will also find area Nature trails throughout the Park. The View at Spring Canyon is Spectacular... Lake Roosevelt Stretches out forever to the East, giving way to the Granite and Basalt Cliffs that Form the Coulee Walls.... in the distance, only a couple miles away, is the Grand Coulee Dam, holding back the Mighty Columbia River, converted to the 152 Mile long Lake Roosevelt. 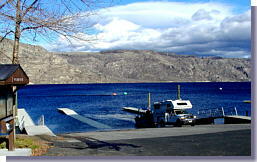 Spring Canyon boat Ramp is one of the few entry points into the Grand Coulee end of Lake Roosevelt for the fisherman and Camping Enthusiast alike. Quick Note: Gas is not available at Spring Canyon, so Be sure to fill up the Boat before venturing out. You will also find a Tent Campground and RV Park on a first come first served basis, just above the Beach and the Park. and the Main Park Rangers Offices. 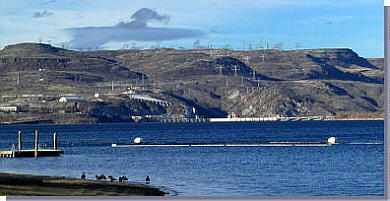 Spring Canyon is located 1 mile off of Hwy SR174 approx 2 miles East of Grand Coulee. From the SR174/ SR155 Junction; Go East for 3 miles. Go Left at the top of the Hill, it is clearly marked. Drive 1.4 miles down to Lake Roosevelt and Spring Canyon National Recreation Area.